We were approached by the owners of Lorimat Jewellers – a family business which has operated in the heart of Kilkenny for more than 30 years. They already had a basic website design with just a few items listed. They wondered if we could add more and make their site more attractive. We ended up doing far greater things. On visiting the shop, it was immediately obvious that they had a vast and impressive range of Vintage Engagement Rings, Wedding rings, and Eternity Rings. Keyword research told us that there are approximately 1,000 online searches per month in Ireland for these exact terms. We therefore advised that they concentrate their digital marketing strategy on this element of their business, due to the high demand, high net worth, and high likelihood of repeat business (a couple who buy an engagement ring there will quite likely come back for their weddings rings, and potentially an eternity ring at a later stage). They agreed. We chose Vintage Engagement Rings as the domain name and we set to work. Our design/development team came up with a website design that is both classic and contemporary in style. Retro silver tones intersperse with flashes of colour throughout, to give a vintage ‘feel’ while showcasing the true beauty of the rings on offer. Our copywriter spoke with the shop owner at length to get the story of the company history, all the services they provide today, and to write product descriptions for the more than 50 rings that were the first to be listed online. 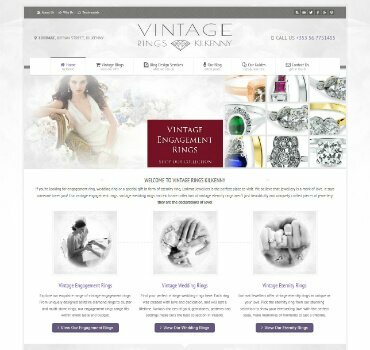 As this was a new direction in marketing for the client, we also designed a new logo for ‘Vintage Engagement Rings’. Our clients were thrilled with the results and immediately enjoyed an upsurge in business after their new site went ‘live’. Show your love with a style, browse through products and services that Vintage Engagement Rings provides today!